Chipworks » Blog Archive » Common Platform Goes Gate-Last – at Last! Common Platform Goes Gate-Last – at Last! 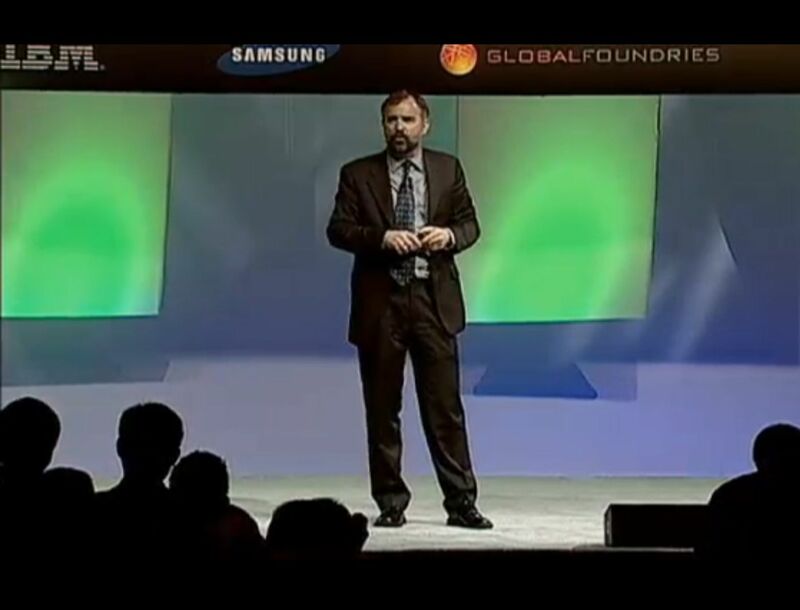 At the IBM/GLOBALFOUNDRIES/Samsung Common Platform Technology Forum on Tuesday, Gary Patton of IBM announced that the Platform would be moving to a gate-last high-k, metal-gate (HKMG) technology at the 20-nm node. 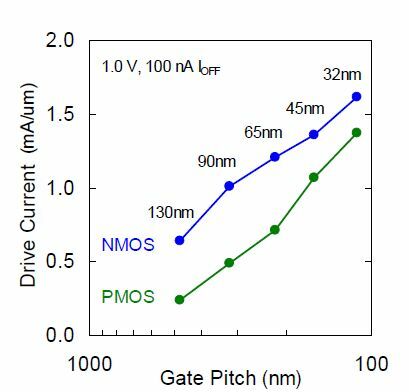 ï»¿ ï»¿ï»¿We can clearly see the narrowing between NMOS and PMOS drive currents at the 45-nm node, namely with the start of replacement gate (gate-last) technology. So it seems obvious that to have high-performance PMOS, gate-last is the way to go; admittedly IBM and their allies have been using compressive nitride for PMOS, which Intel never have (at least to my knowledge), but there are limitations to that – now that contacted gate pitch has shrunk to less than 200 nm, there is not much room to get the nitride close to the channel – a problem that will increase with further shrinks. So in a way it’s not surprising that the Platform has made the change; nitride stress is running out of steam, and gate replacement offers improved compressive stress for PMOS, and other stress techniques for NMOS (Intel builds some stress in with the gate metal). Gary Patton said that IBM have been evaluating gate-last in parallel with gate-first since 2001, and it’s logical that they and their partners should. Both GLOBALFOUNDRIES and Samsung have published on gate-last, so there has been some evidence of checking out the parallel paths. Density – gate-first has higher density, since gate-last requires restricted design rules (RDRs). That prevents orthogonal layout, requiring local interconnect; but at 20-nm RDRs are needed for lithography, so that advantage disappears. Scaling – it’s easier to scale without having to cope with RDRs; at 20-nm there’s no choice. Power/performance – the gate last structure allows strain closer to the channel, increasing performance; but fully contacted source/drains increase parasitic capacitance, slowing things down. According to Patton these net each other out for a high-performance process, making the gate first/last decision neutral. For low-power processes, strain is not used at the 45/32-nm nodes, so gate-first gives better power/performance metrics. At 20-nm strain has to be used for low-power, and with the need for RDRs and local interconnect, the balance shifts in favour of gate-last. So it appears that for the Platform the equation between pure transistor performance, process convenience, and power/performance made gate-first the choice at 45/32/28-nm, but at 20-nm the balance changes to make gate-last the way to go. That was likely influenced by the adoption of immersion lithography between 65- and 45-nm, which reduced the need for RDRs. Interestingly, now that Intel is using immersion lithography at 32-nm, they have loosened up on the RDRs, there’s more flexibility in the layout than there appeared to be at 45-nm. I have to congratulate the Common Platform marketing guys on putting up a live webstream of the Technology Forum – I couldn’t get to the event itself, so wouldn’t have been able to comment without it. The stream will be available until April 29, so if you want to see Gary Patton for yourself, you can. ï»¿Unfortunately, talking to my journalist colleagues, no slide sets were available, even at the press conference, so watching the stream occasionally leaves you puzzled as to what’s being talked about; and as you can see from the screen shot above, the room screens were carefully blanked out for the camera. Also, the breakout sessions in the afternoon were not streamed, or if they were, not recorded for later viewing. Still, kudos to the Platform for the live stream we did have, and the pre-recorded panel sessions! From Gary’s and other comments at the Forum, it’s clear that the first HKMG products will be launched at 32-nm, and 28-nm will be following along fairly soon after. We can’t wait to see some! For those waiting for more details if last year’s IEDM, I will finish my review; there were 36 sessions with 212 papers, so not a small task to do conscientiously, the Christmas break interrupted things, and there have been distractions since (like the Forum! ), but I will get there!